Since the dawn of social media, videos, images and songs have circulated around the Internet. As years passed, the speed at which these things traveled increased dramatically. Videos began accumulating hundreds of thousands of views in a matter of weeks…then days…then hours. Soon the mainstream media and the rest of society needed a term to describe the act of "being viewed by a crap ton of people in a short span of time." Thus the term "going viral" was born. It was a status to which all videos and other forms of media aspired. Once you "went viral," you knew you had made it (or at least your boss finally considered your social media stats as legitimate "ROI"). Though the line between being just an average video and one that has "gone viral" was never precise, there was a clear distinction between a video nearly everyone had seen and a video only a small community had viewed. And that was fine for a while. It made sense and helped us to quantify a video's perceived success without referring to it as the aforementioned "viewed by a crap ton of people." But over the last couple years, the number of people on the Internet has grown, and the percentage of those people who are utilizing social media skyrocketed. Because of this, videos travel faster than ever (and fizzle out just as fast), and so many videos are viewed by so many people that more videos "go viral" now than ever. As a result, every day of my life on CNN I see "so-and-so video goes viral." Kid President. Harlem Shake. That video where the guy sings about what happens to Disney princesses after the movies. It's not news if it happens every day, CNN. And you know what? This DOES happen every day. 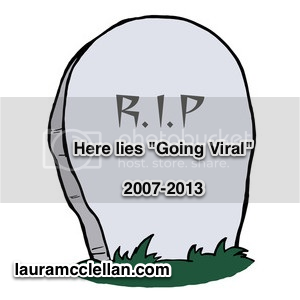 Videos "go viral" constantly. That's just what the Internet IS now. So I propose we retire that term altogether. It has lost all meaning because we've used it so much. It's kind of like when someone calls everything "epic" or "amazing" and then when something really is amazing, like an elephant riding a unicycle, it doesn't mean anything anymore. It's not a perfect metaphor, because unlike the above scenario, I don't think we can rein it in and only apply it to certain videos or memes who reach a certain standard. They all reach that standard. So let's just get rid of it altogether and say "this video exists on the Internet." Or something. I think that's more accurate. The "and a lot of people have seen it" part is pretty much assumed, if you're talking about it. Going viral is no longer anything special, society. It's just not. Let's let this term die with the harlem shake. What's your favorite video on the Internet?